Ford 2020 Super Duty pickup has styling and interior refinements, a new big-block gasoline V-8, a third-generation Power Stroke V-8 diesel, and a new 10-speed TorqShift automatic transmission. The new powertrains and other improvements are aimed at retaining Ford’s sales dominance, and usher in a series of new vehicles to be introduced through 2019. During this year, “75 percent of our product portfolio will be replaced,” said Kuman Galhotra, Ford president, North America. In 2018, Ford sold almost 1 million F-series trucks, from the F-150 to F-750, in 2018, the third best year in the last 71 years, “and we are doubling down on commercial vehicles, which are really strong for us,” Galhotra said. The 7.3-liter gasoline V-8 engine delivers high performance in a compact package, said Mike Pruit, chief engineer for powertrains. It is expected to be the most powerful gas V8 in its class, providing durability, ease of maintenance, and higher towing and payload capability. It uses a cam-in-block, overhead valve architecture with cast iron block and forged steel crankshaft for durability, and port injection with variable valve timing to optimize the intake and exhaust to match performance with workloads. 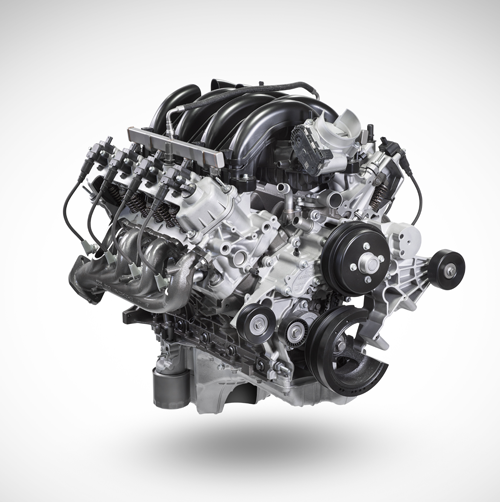 As with other Ford gasoline engines, the new large V-8 can be ordered with a gaseous prep package that, when fitted with appropriate fuel systems, allows it to burn propane or natural gas. The 7.3 will replace the 6.8-liter V-10 in SuperDuty trucks, and joins the standard 6.2-liter gasoline V-8 in the SuperDuty engine lineup. The updated 6.7-liter Power Stroke V-8 diesel has a 36,000-psi fuel-injection system with new injectors that precisely meter and spray up to eight times per stroke to control noise levels and optimize combustion, Pruit said. A redesigned electronic-actuated, variable-geometry turbocharger provides improved pumping efficiency and throttle response. Structural enhancements increase the strength of the cylinder head, block, connecting rods and bearings to handle higher cylinder pressure and increased output. New steel pistons for the Power Stroke provide higher firing pressure capability and less friction, making for improved performance and increased horsepower and torque. Ratings will be announced later. Ford 7.3-liter gasoline V-8 will replace the 6.8-liter V-10 in Ford’s Super Duty trucks. The big-block V-8 includes port fuel injection and variable valve timing. The new heavy-duty 10-speed TorqShift automatic transmission, based on the F-150’s 10-speed, is available across all three Super Duty engine offerings for the new 2020 Super Duty trucks. This TorqShift features a wider gear ratio span than the 6-speed it replaces, and is designed for the harshest towing conditions, Pruit said. It will have live-drive power takeoff, which allows the operator to engage industrial equipment and accessories, such as dump bodies and snowplows, with the truck in motion. This electronically controlled transmission has selectable drive modes that include normal, tow/haul, eco, slippery, and deep sand and snow. Even with four extra gears, the entire 10-speed unit fits in the same space as the 6-speed and weighs only 3.5 pounds more, he added. 2020 SuperDuty trucks will have a new Pro Trailer Backup Assist to enable a driver to maneuver even the largest trailers into the tightest of spaces. With hands off the steering wheel, drivers use the Pro Trailer Backup Assist knob to easily steer the trailer via the reverse camera. The truck’s Trailer Reverse Guidance system shows trailer angle and direction, and provides steering suggestions to most efficiently direct a trailer backward. Both systems are built to accommodate all trailer styles, including fifth-wheel and gooseneck trailers. The new F-series Super Duty debuts as the most tested pickup in the company’s history, Pruit said. It endured more than 12 million miles of testing for the 2017 model year, and got an additional 7 million miles for 2020 to ensure the new model can stand up to the rigors the most exacting truck customers demand of it. For remote communications, every new 2020 Super Duty will include a FordPass Connect embedded 4G LTE modem with wi-fi access for up to 10 devices. Available lane-keeping alert helps drivers stay between the lines on the road, while the Blind Spot Information System with trailer coverage monitors for vehicles in blind spots, even when towing. Pre-Collision Assist with Automatic Emergency Braking and Pedestrian Detection aids in avoiding or mitigating collisions with other vehicles and pedestrians. These features are standard on XLT and above Super Duty models. Modern touches include the addition of wireless charging and USB-C ports to power portable devices. The Super Duty is the number 1 full-size pickup in brand loyalty, said Todd Eckert, marketing manager for commercial trucks. In the construction segment, Ford sold 46.3 percent of all pickups and 54 percent of all chassis-cab trucks.